My 153 gallon pond on 8/6/06, facing northwest. Pond Dimensions: I need to measure it. ~10% surface area 6.5" to 7.5" deep, ~25% surface area 10.5" to 11.5" deep, and ~65% surface area 22.5" to 23.5" deep. This pond contains many adult and tadpole green frogs, about 51 rosy red minnows, 1 male Southern redbelly dace, black ramshorn snails, pond snails, and various bugs. The pond has three pots of iris, sweetflag, five pots of waterlilies, duckweed, hornwort, anacharis, etc. The pond is filtered by a PondMaster 700 with MagDrive 700 gph pump. A de-icer and Luft air pump run during the winter. My favorite pond web site is http://www.fishpondinfo.com. I extracted this text off my web site. Ground was broken in late August, 1999. The liner went in on 10/3/99 but the edging was a problem and was mostly done on 10/10/99. The first plants and animals were added on 10/17/99. I should have had over two feet of liner overlap at the long ends but I had barely an inch. Things never go as planned. I did not mis-calculate. The liner simply went in slightly offset and bunched up a lot making a big mess. The edging is regular bricks topped with patio bricks. On 3/26/00, I cleaned out the filthy 153 gallon pond. After removing the wood frog eggs and pots, I drained away half the water. Then, I ran various nets along the shelves and bottom. The fun part was rooting through the black slop for life. The debris was 90% live and dead earthworms. I guess they are not a problem in my big pond because the orfe and goldfish eat them. I also found 3 large dead green frogs, 3 live green frogs, about half a dozen red shiners, about half a dozen Ozark minnows, and one mayfly. I did not net out any bluntnose minnows or mosquito fish although there may be some that evaded the net. By the way, I use the bridge every day! For more history on the pond, go to my web page and for details on how I cleaned it out, go here. 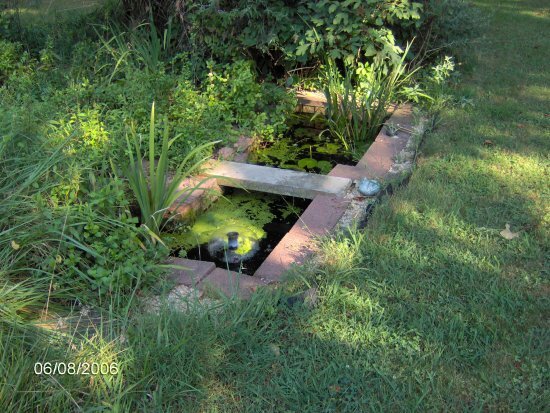 Click here to see more photos of this pond.